Kickstarter is getting pretty hard to ignore. In 2012 alone 2,241,475 people pledged a total of $319,786,629 and successfully funded 18,109 projects. Blasting through the traditional way of raising capital for a new product or invention. Vancouver based Eric Saligumba knows the power of Kickstarter very well. With (at the time of writing) $79,000 raised and with still 12 days still to go Saligumba’s new EVA shoes are creating a buzz online and around the world. Mr Saligumba set the target of $20,000 to allow him to get further moulds made up to allow the CrossKix shoes to go into full production. Now he has passed this target he’ll be able to use the additional funding to produce more colors and sizes. Guess what; he now has a community of 1,428 “backers” or people interested in the project to use in customer research and development. So not only does the project receive almost four times the required funding but he now has a loyal customer base from day one. That is the power of success on Kickstarter. To be a success on Kickstarter it really comes down to have a good idea or product to get people inspired and back you. Crosskix is a classic idea. We’ve all heard of Crocs and thought yeah cool idea but really lacking in style. 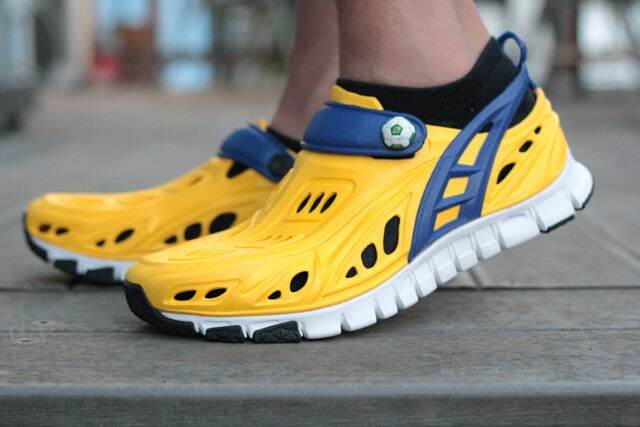 Well improving on the design both functionally and style Mr Saligumba has been able to attract customers from all over the world that simply want a comfortable, durable and water proof shoe. You can check out this successful Vancouver based project by clicking here if you read this in time you may even get to back a winner. We’re a home for everything from films, games, and music to art, design, and technology. Kickstarter is full of projects, big and small, that are brought to life through the direct support of people like you. Since our launch in 2009, more than 3.9 million people have pledged over $582 million, funding more than 40,000 creative projects. Thousands of creative projects are raising funds on Kickstarter right now. Each project is independently created. The filmmakers, musicians, artists, and designers you see on Kickstarter have complete control over and responsibility for their projects. Kickstarter is a platform and a resource; we’re not involved in the development of the projects themselves. Anyone can launch a project on Kickstarter as long as it meets our guidelines. Creators keep 100% ownership of their work. Backers are supporting projects to help them come to life, not to profit financially. Instead, project creators offer rewards to thank backers for their support. Backers of an effort to make a book or film, for example, often get a copy of the finished work. A bigger pledge to a film project might get you into the premiere — or a private screening for you and your friends. One artist raised funds to create a wall installation, then gave pieces of it to her backers when the exhibit ended. Creative works were funded this way for centuries. Mozart, Beethoven, Whitman, Twain, and other artists funded works in similar ways — not just with help from large patrons, but by soliciting money from smaller patrons, often called subscribers. In return for their support, these subscribers might have received an early copy or special edition of the work. Kickstarter is an extension of this model, turbocharged by the web. Backing a project is more than just giving someone money. It’s supporting their dream to create something that they want to see exist in the world. People rally around their friends’ projects, fans support people they admire, and others simply come to Kickstarter to be inspired by new ideas. Some projects take longer than anticipated, but creators who are transparent about issues and delays usually find their backers to be understanding. We’re a for-profit company based in New York City’s Lower East Side. We spend our time making Kickstarter a little bit better every day, answering questions from backers and creators, and finding new projects to share. If a project is successfully funded, we apply a 5% fee to the funds collected. We believe that creative projects make for a better world, and we’re thrilled to help support new ones. After 35,000+ successfully funded projects, we know that building a community of backers around an idea is an amazing way to make something new. Looking for a online marketing company for your Kickstarter Project? Get in touch and let us show you what we can do! ← Does Social Media Help Search Engine Optimization (SEO)?